A young professional musician intent on exploring the possibilities of the viola. Laurence Schaufele is a young professional musician intent on exploring the possibilities of the viola in a wide varieties of genres. 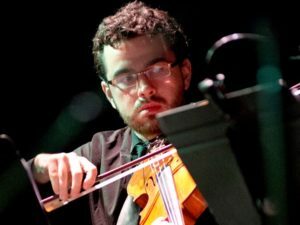 A recent graduate of The Glenn Gould School he has acted as principal violist of the Royal Conservatory Orchestra and played with many other orchestras in the Greater Toronto Area. He has played with the Afiara Quartet in part of the Discovery Series based in Mazzoleni Hall, Toronto. Laurence participated in the Canadian Opera Company Orchestra Academy in 2015. A mentorship program under the tutelage of Johannes Debus and the principal string players of the COC Orchestra. Last summer Laurence was part of Luminato’s production of Apocalypsis by R. Murray Schafer. Laurence is a founding member of the Odin String Quartet as well as a member of a renaissance bluegrass band called the Renaissance Ramblers. Laurence’s teachers have included Bill van der Sloot, Michael van der Sloot, Nick Pulos, and Steven Dann. Laurence has had the opportunity to perform in masterclasses given by Roberto Diaz, James Boyd, Kai Gleustein, Pinchas Zukerman, Paul Nuebauer, Laurence Lesser, Paul Katz, Kim Kashkashian, and Hank Guittart. Laurence has participated in the Banff Summer Master Class Program, the Young Artists Program in Ottawa, Domaine Forget, Morningside Music Bridge and the Northern Lights Music Festival in Ajijic Mexico. Laurence has also been a prize winner at the national level of Kiwanis music festival two years in a row.